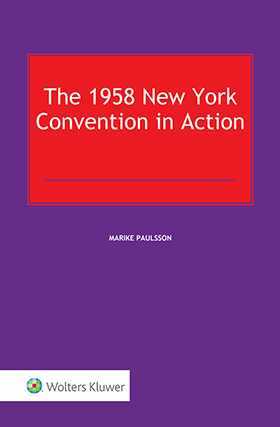 The 1958 New York Convention in Action provides an in-depth objective account of the Convention in terms of textual analysis and judicial practice. The 1958 New York Convention itself has been called the most effective instance of international legislation in the entire history of commercial law. However, the concise text of the Convention leaves open a host of significant and complex questions, which have been answered in different ways: however, as difficult cases arise and demand solutions, inconsistent outcomes can be generated. By drawing on the Convention’s drafting history in great detail, this book presents a coherent account of how the most recurring interrogations about the text are reflected (or not) in judicial practice. The author has studied more than 1,700 decisions rendered under the Convention since its inception in 1958 in order to provide a succinct selection of landmark cases per article. The book is a comprehensive treatise on the entire Convention in action from the date of its conclusion in 1958 to the present date. The Convention is discussed on the basis of the two most fundamental authoritative sources: its drafting history and its judicial application. The entire drafting history and documents – from before, during and immediately after the conclusion of the Convention – are analyzed in order to provide the reader with a useful analysis of the drafters’ intent and historical background necessary for proper interpretation of the Convention. Based on the drafting history, a special Index regrouping the drafting history per Article of the Convention has been created by the author. This is the first time that such an Index has been made available. The book includes chapters focusing on the framework and Resolutions of the Convention and on the Convention being used as an instrument of international law. The 1958 New York Convention in Action, with its intense investigation of the complex reality underlying contracting States’ commitment in principle and judicial application, provides a clear conceptual framework to the reader to gain an understanding on the Convention, that will help avoid outcomes at odds with the purposes of this important instrument. Lawyers and judges will rely on this book not only to situate the Convention in national legal orders where it is intended to produce an effect, but also to discover practical ways to respond to distinct questions of application. In short, this book brings the text of the Convention to the days of modern trade by revisiting the drafting history of the articles and thereby brings the drafters' intent back to the surface.